Lovely Country Villa in Tuscany. The Villa is situated in a wonderful position overlooking the valley of a small stream in the country. Completely surrounded by wheat fields and olive groves. An ideal place for relaxation and contact with nature. 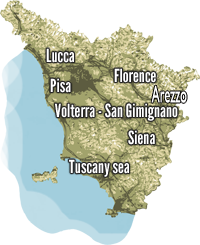 4 km away from the village of Pomarance market and services of all kinds, just off the beautiful Etruscan town of Volterra, the Etruscan Coast. The position and the big tree that dominates the garden of the house give the flavor of Tuscany of the past. The interiors are well maintained and original, thanks to the artistic talent of the owners, the kitchen is dominated by a large fireplace, the 3 rooms are furnished with original furniture and the bathrooms are decorated with mosaics and ceramics produced by the owners. The bathroom ground floor has been built on the premises of the old wood stove. The owners live in a portion of the building where they have a small studio pottery that work themselves. The garden is furnished with table and chairs for outdoor dining, sun loungers and a small pool 90 cm deep ideal for children or for refreshment while sipping fine wine! On ground floor face on the garden living room with kitchen with fireplace and a bathrom with jacuzzi shower. First floor there are 1 bathrom with tub and shower, 1 double bedroom On the first floor 3 bedrooms: 1 bedroom with double bed and bunk beds, a bedroom with French bed, 1 bedroom with double bed and a single bed.